Interesting that from issue 30 onwards, Spider-Man's logo is changed to a smaller, less prominent, one, while the Zoids logo is increased in size, as if that is the main draw from then on. 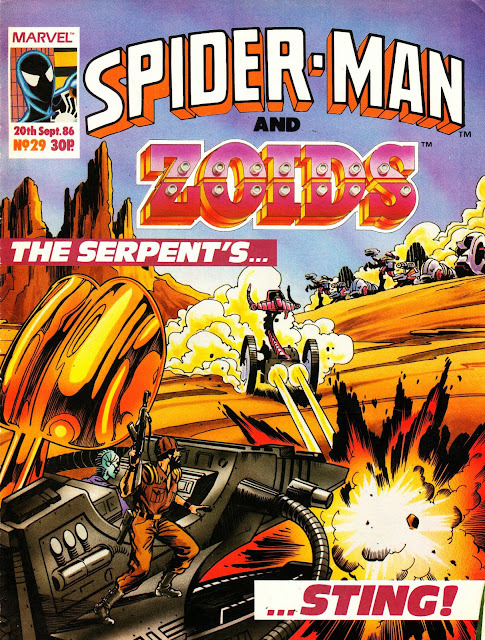 I suppose it made sense to emphasise Zoids, since at the time the Transformers weekly would be approaching something of a creative zenith as it tied-in with the then forthcoming (to the UK) release of Transformers: The Movie. 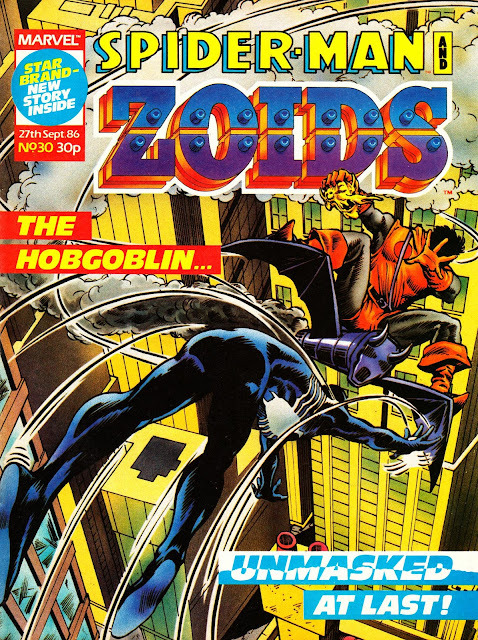 Spider-Man, despite his popularity and longevity, no longer had a regular presence on UK television by this stage, as the regular broadcasts (repeats only, as the BBC had already shown all the episodes bar one by the end of 1985) of Spider-Man and his Amazing Friends would have been on their way out by this time, if not finished altogether. Surely not coincidentally, the next time an actual Marvel character headlines a regular Marvel UK comic is the Hulk in The Incredible Hulk Presents nearly three years later, to tie-in with repeats of the 1982 Hulk animated series on Channel 4. The cover for issue 30 is also notable for the re-designed inbox. Spidey's face had now been replaced with text describing either the contents or a free gift. This became something of a ' house style ' across the m-uk line in titles such as TRANSFORMERS. And its a style I'm quite fond of. The cover blurb was of course another red herring. 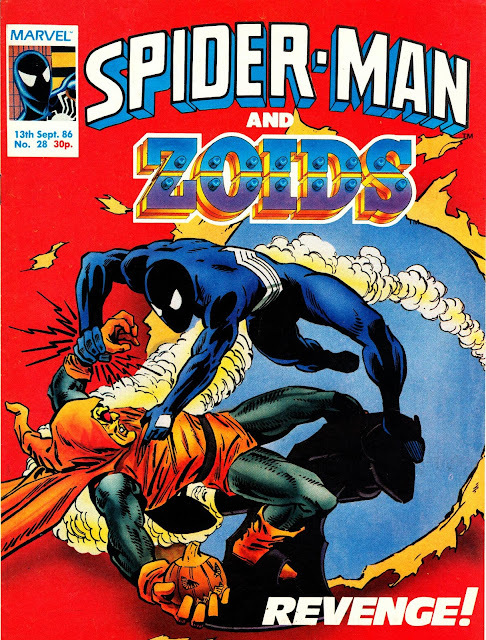 The story which revealed ned leeds to be the hobgoblin was never actually published during spidey's run from the 80's. However it WAS reprinted in the more recent collectors edition of SPIDER-MAN. 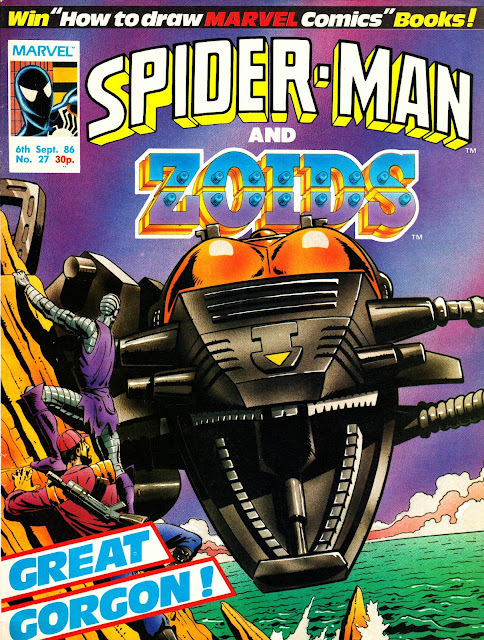 I should add that the new style inbox only lasted for about 5 issues then reverted to either a pic of spidey or a zoid.